The new year is just around the corner! 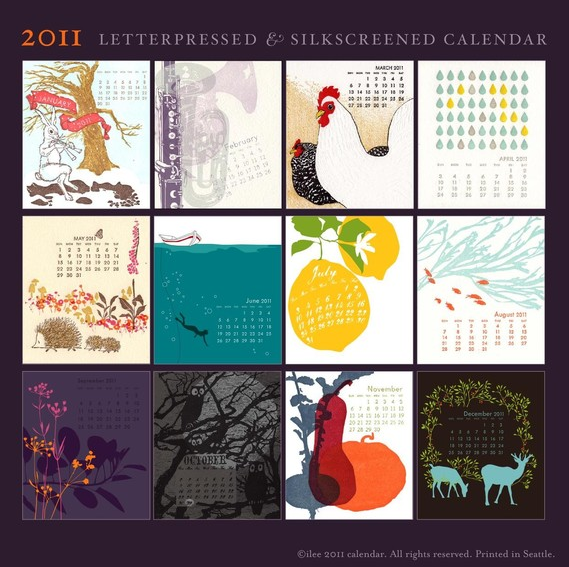 You probably don’t want to be reminded another year has come and gone, however you will want to check out these beautiful handmade letterpress 2011 calendars which will help you realize how fast time goes by, but in style! 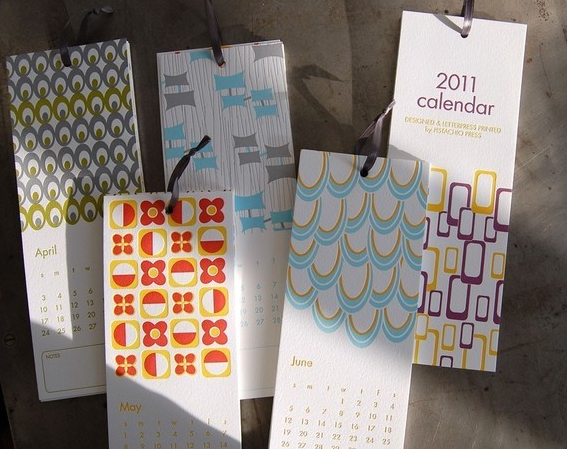 Who says a calendar has to be boring and tacked to a wall? 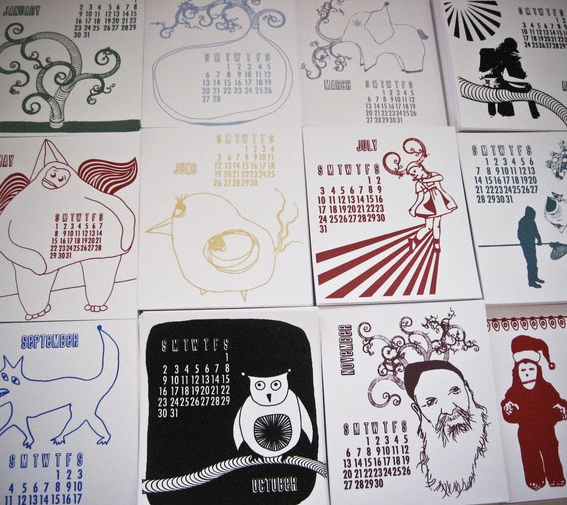 They are designed and screenprinted by hand in the Unik studio location. 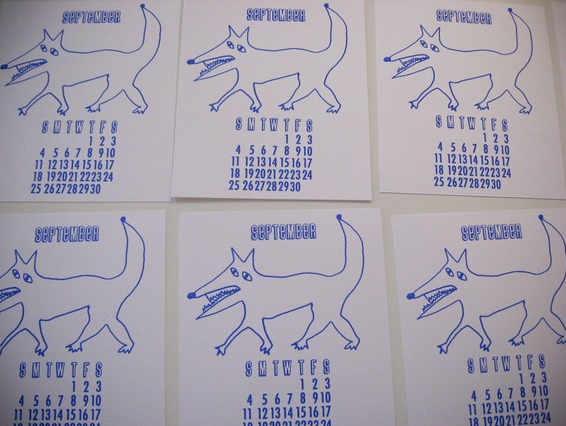 Each month is printed seperately on a 4.75″ x 5.5″ piece of white cardstock. 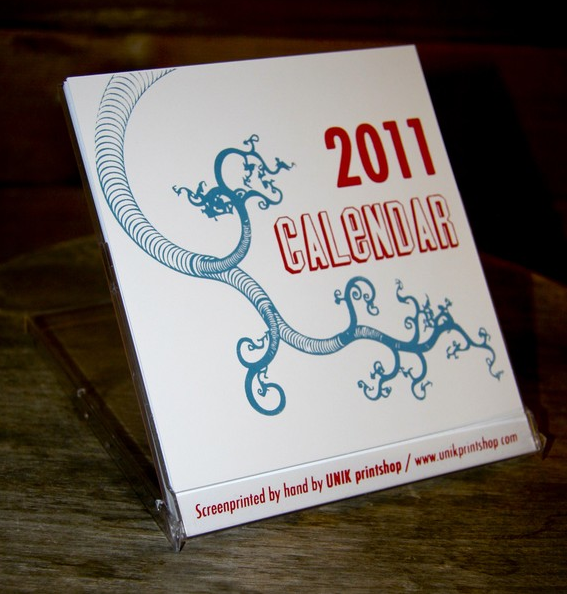 The calendar comes in a transparent calendar case, which is the perfect display to showcase the calendar on your desk. Available from Unik Print Shop. 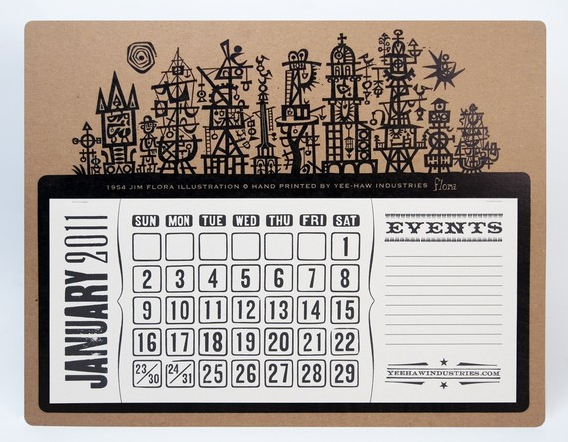 This calendar has been printed on plush, eco-friendly, 100% tree-free cotton pape. Each page was printed by hand on an antique Vandercook No. 4 letterpress. There are nine different ink colors throughout and a very sweet notes section at the bottom of each month for birthdays and important reminders. 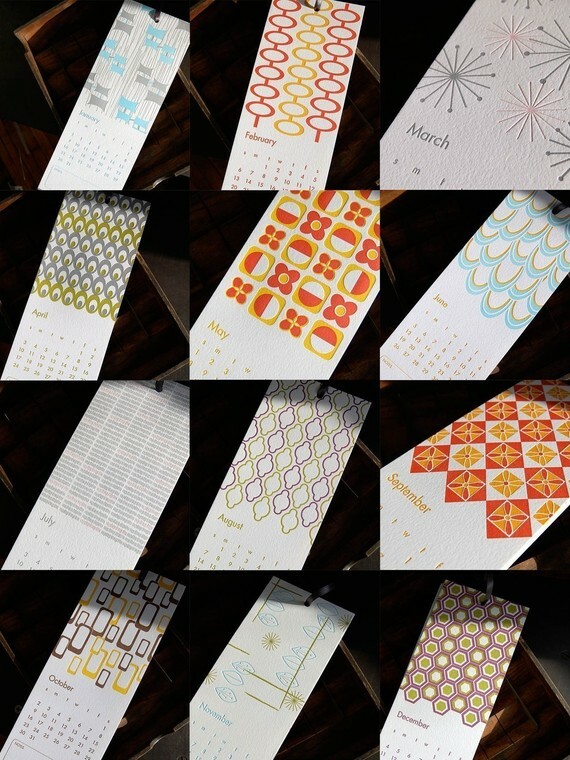 The size of the calendar is 4″ wide by 11″ tall and is punched through the top and bound with ribbon. At the end of the year (or before) each month may be trimmed to 4” x 6” and framed. This Jim Flora illustration from 1954 is the featured image on this poster calendars. It is hand-printed letterpress in black on kraft card stock (100% post-consumer recycled). 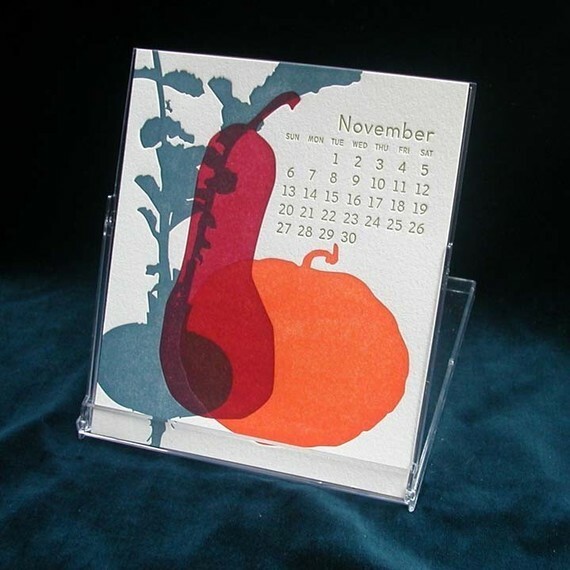 This 2011 letterpress and silkscreen printed desk calendar includes 12 monthly cards with original artwork and one extra year at a glance card. Each set comes in a clear jewel case stand. Hand letterpressed on thick tree-free cotton paper. 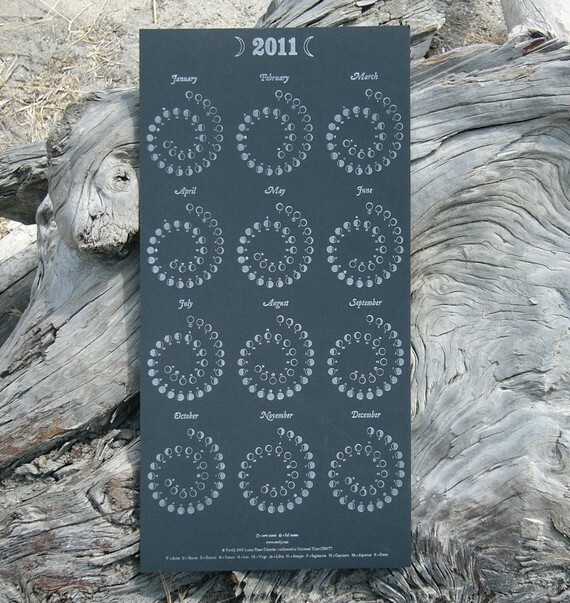 The unique spiral design shows each phase of the moon daily. Includes zodiac symbols. The calendar is carefully calibrated according to Greenwich Mean Time (GMT), also known as Universal Time.